C. L. Moore – The Future is Female! C. L. Moore (January 24, 1911–April 4, 1987), the eldest child of Indiana natives Otto Moore and Maude Jones Moore, was born Catherine Lucille Moore in Indianapolis, where her father was an inventor and mechanical engineer. An often-sickly child “reared on a diet of Greek mythology, Oz books, and Edgar Rice Burroughs,” she entered Indiana University in 1929, publishing stories in The Vagabond, a student magazine, but left in the middle of her sophomore year. 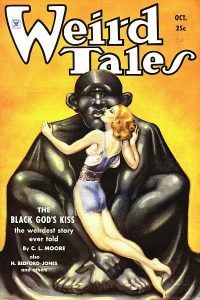 Working as a stenographer in an Indianapolis bank through the Great Depression, she began to sell her stories; the first, “Shambleau,” appeared in Weird Tales in November 1933. (Weird Tales editor Farnsworth Wright was, perhaps apocryphally, so impressed upon receiving it that he closed his offices for the day in celebration.) Moore continued to write stories featuring “Shambleau” protagonist Northwest Smith (a swashbuckling rogue adventurer who went on to inspire characters including Han Solo) while publishing a series of sword-and-sorcery tales featuring the first female protagonist in that subgenre, Jirel of Jory. Moore’s work attracted an admiring letter in 1936 from aspiring author Henry Kuttner, who addressed her as “Mr. Moore.” The confusion was soon cleared up and the two married in 1940, thereby initiating a prolific, collaborative literary relationship. Using pennames including Lewis Padgett, C. H. Liddell, and Lawrence O’Donnell, Moore and Kuttner published dozens of stories (including mystery, detective, and suspense as well as speculative fiction) and several novels; they also completed their undergraduate degrees in English, at the University of Southern California, in 1954. 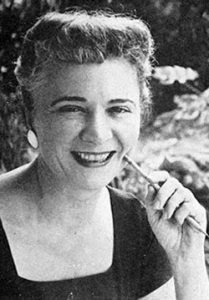 Separately, Moore published the novels Judgment Night (1952) and Doomsday Morning (1957) and was nominated for a Hugo Award for her 1955 novelette “Home There’s No Returning.” After Kuttner’s death in 1958, she turned to television writing, completing scripts for Tales of Frankenstein (1958), The Alaskans (1959), 77 Sunset Strip (1960), and Maverick (1961). In 1963 she married businessman Thomas Reggie. In 1981, the onset of Alzheimer’s disease prevented her from personally accepting the World Fantasy Lifetime Achievement Award. She died at seventy-six in Hollywood, California, and was posthumously inducted into the Science Fiction Hall of Fame. In 2004 she posthumously received the Cordwainer Smith Rediscovery Award.